Which one is your favorite? Do leave me a comment! Oooh, I love that printed skirt! 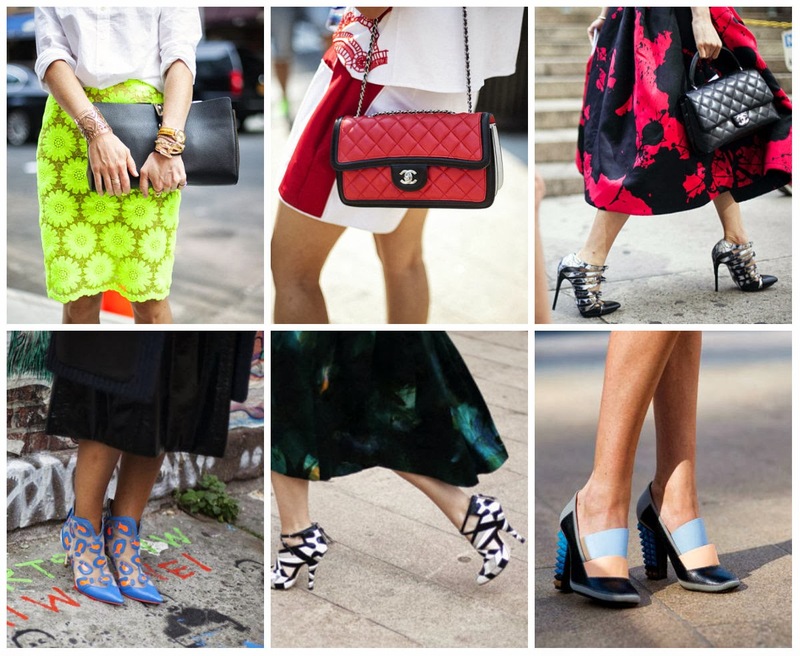 Fabulous street style picks! I love the LBD! Thanks for your sweet comment and following. I’m also following you now! Statement pieces are actually that. Something that stands out among the clothes we piece together. I love skirts! So naturally thats where my attention goes to right away. Love the printed skirt. And under accessories, I am so in-love with the flower detail of the yellow neon number and the billowy black and hot pink skirt. super love your blog most especially the collection of the look on this. i may say that the grungy one was the best. I really want to try those long skirts! Very classy! By the way, you wanna follow each other? Let me know! Awesome post.This is a great beauty blog of yours. The printed skirt is definitely my fave!! Continue posting fashion week summaries like this! I love these looks! the first one is my favourite! I’m all about the shoes in this post. AMAZING. My favorite look is the first one! I love how she paired such a retro-looking dress with such modern, bold heels. Thanks for sharing about Talia. It breaks my heart that such a bright spirit passed away, especially when cancer struck me so closely and personally when my mom was diagnosed with breast cancer. I wish the company would donate more than $5, but I appreciate any efforts to help fight cancer. Caseyy!! Yeahh I soo Love that Retro Looking dress too.. It was also very sad to hear about Talia’s News !! Lost my Aunt and my best fren’s Mom to Cancer. love the heels. i totallly want heels like those, but i can never walk in them. This made me feel more excited for the Philippine Fashion Week! Hi!, I love all the street styles but I´m madly in love with the first three street styles. NYFW is great to get some inspiration. I love the little black dress! I love the printed skirt and blocks. I want to have one! let me start by saying that your blog is sooo chic, I love it already 😀 and those Chanel quilted bags are to die forrrrrrrrrrrrrrrrrr…. That printed skirt is so unique! Almost like you are there! love the chevron heels…and that printed skirt!!!! new follower here…hope you check out my blog too! So many great pieces… 🙂 I love the first look. All the outfits are lovely.. I love color blocking and I’m a sucker for bright color!! I like the printed skirt. I admire how they mix match their clothing to show their unique personality. Oh MY!!! I need those chevron shoes in my life!!!! I want this awesome green-black shoes from the first shot! I’ve already seen the first pic…and I loved it. Very iconic of a day in NYC during fashion week. printed skirt and color-block! Fresh and fab! Omg!! I want that blue shoe!!! aww talia I love her!